This program is a cooperative effort to assist in understanding regulatory concerns and come into full compliance with federal, state, and local environmental regulations. Businesses who comply are marketed to the public in information to support environmentally-friendly businesses. The Town of Forest Heights has taken the initiative to "Go Green" by becoming the first local government in Prince George's County to convert all government owned facilities to the green standard with the unveiling of the green roof on the municipal building. The $350,000 renovation is expected to save countless tax payer dollars and cut energy costs for the municipal building by half. The renovation project also included energy efficient windows. The Tree Canopy Program is also expected to provide green coverage in many places within the town to reduce sun heat exposure, improving our air quality by natural methods and erecting trees for a cooler overall temperature. Community Trees: A Living Investment - more valuable than you'd suspect! Washington, D.C. – Pepco announced today that it will provide 1,350 free trees to customers in the District of Columbia and Maryland through the Energy-Saving Trees program. It’s the sixth year of the partnership that helps customers conserve energy and reduce household electric bills through strategic tree planting. Since 2011, Pepco customers will have received more than 13,000 free trees thanks to the partnership between Pepco and the Arbor Day Foundation. Trees are made available first to customers who were on the waiting list from the program last year. Those customers will receive an email from the Arbor Day Foundation in the next few weeks. The remaining trees will be distributed beginning this week to customers who make the request while tree supplies last. Pepco customers can request up to two free trees by visiting www.arborday.org/pepco, or by calling 1-855-670-2771. The 18 to 36 inch trees that will be delivered directly to customers include Eastern Redbud, Crepe Myrtle, River Birch, Red Maple, Northern Red Oak, and are in small containers that allow for the growth of a better root system. The Arbor Day Foundation calculates that the 1,350 trees will produce nearly $294,720 in energy savings within 20 years. An online tool can help Pepco customers find the most strategic location for planting and estimate the annual savings that will result from the tree. The Energy-Saving Trees online tool was created by the Arbor Day Foundation and the Davey Institute, a division of the Davey Tree Expert Co., and uses peer-reviewed scientific research from the USDA Forest Service’s i-Tree Software to calculate estimated benefits. Customers may call the Arbor Day Foundation for technical help and other questions at 1-855-234-3801. For more information and updates, visit www.pepco.com, follow us on Facebook and Twitter at PepcoConnect, and download our mobile app at www.pepco.com/mobileapp. 6 Things Every American Should Know About the Clean Power Plan. en español: Seis cosas que cada estadounidense debe saber acerca del Plan de Energía Limpia. Why We Must Act: For our Families' Health and our Kids' Future. The Final Clean Power Plan: More Ambitious, More Achievable for States. EPA's Clean Power Plan: Lower Utility Bills, Billions in Benefits Every Year. Hook, line and sinker: Check if there are any fish consumption advisories if you'll be fishing. Avoid getting bitten: Always follow label directions when using insect repellants and pesticides. At home, remove places where bugs can live and breed. Breathe easy: Going for a hike, bike ride, or working outside? Check your air quality before you go, and know when to take action to protect your health. Driving along: In hot weather and long trips, save money and fuel by rolling the windows down at low speeds but use the vehicle air conditioner at highway speeds. Also, be sure your car is tuned up and the tires properly inflated. Indicators Update. Find out more about environmental conditions. We've updated the dataset in the Report on the Environment, or ROE. This interactive tool includes maps and charts of five theme areas: air, water, land, human exposure and health, and ecological condition. Also, the website has regional and state trends, and links to what you can do. Danger: Recharge air conditioners properly. If your home or vehicle air conditioner needs to be recharged, be sure to use correct, approved refrigerants. Avoid recharging with refrigerants that have "22a" or "R-22a" in the name as these contain propane or other flammable substances. These refrigerants are not approved and ARE NOT SAFE. “Bee” safe with pesticides. If you use pesticides where bees are present, always READ THE LABEL. EPA has developed new pesticide labels that make it easier to understand how to apply the pesticides safely and correctly. Learn more about protecting bees and other pollinators from pesticides. ¿Habla español? Eche un vistazo a nuestra nueva página Web. Hemos rediseñado el portal cibernético en español de la EPA para facilitar la búsqueda de información sobre cómo usted puede ayudar a proteger su salud, su familia y el medio ambiente. [TRANSLATION: Do you speak Spanish? Take a look at our new web site. We've redesigned EPA's Spanish-language web portal to make it easier for you to find ways you can help protect your health, your family, and the environment. New standards under the Clean Water Act to address stormwater runoff pollution will be financed annually by property owners through their property tax bill. ...start an approved stormwater retrofit project on your property and be eligible for rebates under the Rain Check Rebate Program! Improve your property and help our county, state and country - and get money back! What's going on relative to our town or See directly from the PG County site! 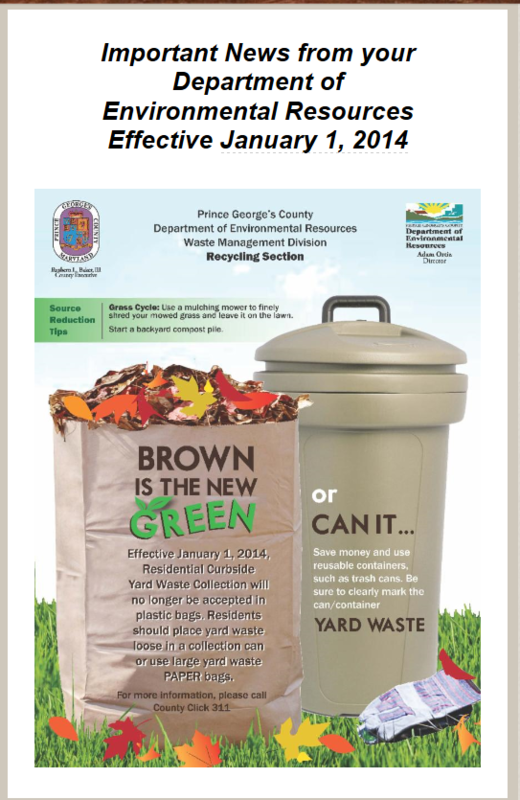 Starting January 1st, 2014, residential curbside yard waste collection will no longer be accepted in plastic bags, as stated below. We have alternatives. 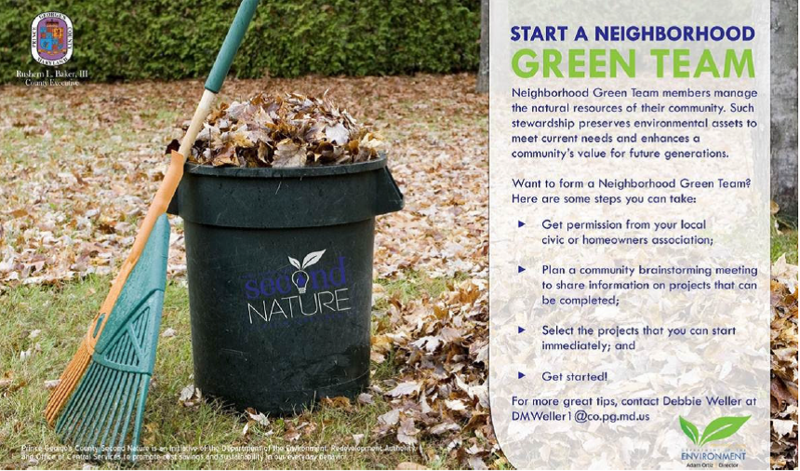 Residents should place their yard waste loose in a collection can, or use large yard waste PAPER bags. Go Green! The Stormwater Stewardship Grant Program sought proposals in two specifics areas: water quality projects that achieve nutrient and/or sediment reduction (funding from $20,000 - $200,000 was available for each project); and engagement projects that aim to involve residents in efforts to improve local watersheds ($5,000 - $50,000 was available per project). The projects announced today include on-the-ground efforts such as rain gardens, bioretention practices, and impervious pavement removal as well as outreach campaigns related to green workforce development and stormwater management. Non-profit organizations, community associations, civic groups, and faith-based organizations were encouraged to apply, as well as municipalities, higher educational institutions, and public agencies. For us, the Town of Forest Heights, receives $49,794: This grant will train a team of high school students to water, weed and mulch 500 street trees as well as educate homeowners about the benefits of trees on their own properties. In addition to the 13 grants, the Chesapeake Bay Trust also announced funding for five new projects in partnership with Prince George’s County through the collaborative Rain Check Rebate Program. For more information on both grant partnerships, visit www.cbtrust.org. Voice of America covered the Town of Forest Heights in their News/Science and Technology section! Why? For our fantastic work in conjunction with the students of the University of Maryland who pitched in with us to improve our Urban Forest, as they defined it - planting trees to help the earth, air, drainage, and even our property values! Check it out and listen here! Rock - or tree - On, Forest Heights! The Town of Forest Heights was one of only seven municipalities, counties and nonprofit organizations in Washington, D.C., Virginia, Maryland and Pennsylvania awarded funding from the Green Streets, Green Jobs, Green Towns initiative sponsored by the Chesapeake Bay Trust and U.S. Environmental Protection Agency. An August 26, 2010 article published in the Gazette helped to spread the word about the town's eco-friendly projects. Forest Heights made the Maryland Chesapeake and Coastal Program (CCP) spotlight once again, having been recognized for our Go Green Program. The Maryland Department of Natural Resources has provided funding to the town to implement our comprehensive green initiative.